Sustainable urban environments are for people who are living in, working in, moving through or just visiting the area. Pedestrians are the most vulnerable of all road users, as they include children, blind and disabled people and the elderly, as well as able bodied people. Urban design of town and city centres should aim for the optimum pedestrian Quality of Service consistent with the overall traffic plan. Shared facilities between pedestrians and cyclists generally result in reduced Quality of Service for both modes and should not be considered as a first option. Cycle track inside parked cars (Copenhagen). Drivers door opens in traffic, not cyclist. Streets can be busy places, and include pedestrians, cyclists and other vehicles. The nature of pedestrians is that they are much less predictable than cyclists and other road users who are generally moving from A to B. Pedestrians can stop at any stage along the way to meet, talk, stand, wait and observe. The Principles of Sustainable Safety, when applied to cyclists and pedestrians, would suggest that both modes be should be segregated whenever possible. Pedestrian areas accommodate a wide variety of activity apart from walking, including standing, waiting, meeting, talking, watching etc. Cycling in proximity to people, gates, entrances, doorways, etc. is not recommended as it is generally incompatible with the pedestrian activity. Bicycle speed is usually much greater than that of pedestrians. Pedestrian should always have priority and signage should reinforce this. Cycling speeds should be reduced to allow for sudden stopping if necessary. Handlebars, pedals and other protruding elements of bicycles are most likely to result in injury to pedestrians in the event of a collision. An alternative route or segregation is preferable. Shared facilities are disliked by both pedestrians and cyclists and result in reduced Quality of Service for both modes. With the exception of purpose-designed shared streets, shared facilities should be avoided in urban areas as far as possible. Cyclists should consider themselves as ‘cycling on the footpath’. Segregate pedestrians and cyclists vertically and/or horizontally. Delineation markings should not be used as they give cyclists an incorrect sense of a dedicated cycle space. 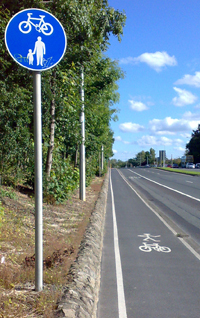 Sufficient width of footpath and cycle track will help both modes to travel in comfort. Sufficient width to facilitate evasive action and/or avoidance of potential conflict. Shared facilities next to vehicular traffic should have a minimum combined width 3.0m. Cycling alignment and speed reduction measures should be considered. Shared facilities might be appropriate at locations where footpaths are wide and the volume of pedestrians and cyclists is low, e.g. in low-density towns and cities, and suburban or recreational areas. They may also be necessary at particular infrastructure features as described below in Section 1.9.4. Visually impaired pedestrians rely on having a longitudinal kerb to demarcate the edge of the footpath. The kerb provides a tapping edge to help them negotiate their way along the footpath. Importantly, the level change tells them which surface is the footpath and which is the road, cycle facility or other surface. The principle of “Up = Safe” is of fundamental importance to the visually impaired. Painted white lines separating the ‘walking side’ from the ‘cycling side’ are not recommended. Even with good signage, pedestrians frequently disregard these lines and will walk or stand on the cycling side. There is a legacy of such markings and signs already in place along existing shared facilities. It is not expected that they be removed or replaced immediately, and can be left in situ pending eventual replacement as part of a network retrofitting programme. 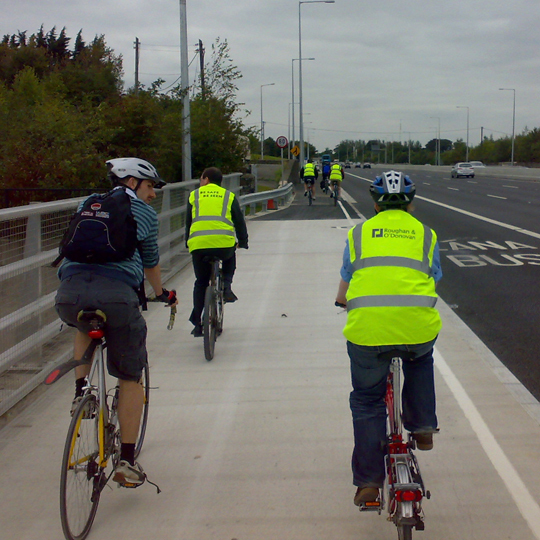 Toucan crossings allow pedestrians and cyclists to cross together without the need for the cyclist to dismount. They are recommended for crossing District Distributors and other main roads. The approaches to the crossing should be designed so as to minimise conflicts between cyclists and pedestrians. The key determinant of whether to mix cyclists and pedestrians on bridges is the speed of the bike. This is influenced by the length and slope of the bridge. 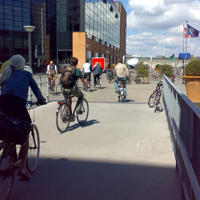 Non-traffic short flat bridges are suitable for shared use with pedestrian priority. However, longer bridges where cyclists are likely to build up higher speeds, should segregate both modes. Where new bridges are intended for cyclist usage, it is recommended that they meet the following requirements.